Living the ballerina life, metal version. Anyway, I did it, and the shoot was last Sunday. And with this write-up I don’t want to just share my story - to me, this video shoot is an example of what is possible, even when you started dancing as an adult. It came totally out of the blue, and there was, like, not even the slightest chance that I would have ever thought of metal music videos as a potential performance option to explore, and that you could get compensated for it. But that’s the whole point. The more examples we all can create for potential performance options, the more they become possible. So here is some more backstory. Kate mentioned she had thought of me because the band wanted long lines and because I had performance/camera experience. Yes, the long lines have been with me for a long time, but the being on video and performing thing was quite new in my life. I would say it only picked up when I started street performing not even a year ago, and then being more active on Instagram, and then teaching, and then doing Live videos, etc etc. I do not consider myself a camera pro, but her remark made me realize how much more confident I had become being in front of a camera. Like, I used to be paralyzed, but now I am just there, and there is a camera. And the viewers have the choice if they wanna do with my imperfections - or not. Kate had picked two other of her amazing students for the shoot, also adult starters. As it turned out later, all three of us had between 5 to 6 years of ballet under our belts. We had our first one-hour rehearsal, where Kate introduced us to the choreography, a week prior to the shoot; a second one the day before the action. I have never been into metal, but the song intrigued me. I became more curious. Kate had already mentioned that her connection to the band was through lead singer Ashleigh. They had trained in ballet together, and just recently reconnected. Here is where it gets interesting. Ashleigh is a trained opera singer, yes, you probably picked up on that if you just listened to the song. The band, Tulip (which wouldn’t have been too bad of a tattoo at all! ), was just very recently founded by Ashleigh and her partner Colin. I was curious to learn more about the band and its backstory, as I wanted to get a bit more into character for the shoot. A trained-opera-singer-turned-metal-front felt exciting. Right down my alley. There was a vibe of doing the unexpected, brazen, following your heart. On the evening after the second rehearsal, i.e. the night before the shoot, I started googling a bit. There was not too much information out there, as the band was literally just starting out (first tracks were released last fall). Then I found this article, an interview with band founder Colin. There was more to this story, and it was deeply moving. It turned out that the band founders grew up in reformed Christian tradition, so basically the opposite of a free-and-following-your-heart environment. It was probably one of the most conservative and rule-stricken setting you can think of. They were both married very young (to other partners), and earlier ideas of doing music together were deemed totally inappropriate. Until they finally decided to break with all that. You can read more in the article, but suffice to say that when they formed the band, and became a couple, “all hell broke loose”, as Colin puts it in the interview. Not just the “people are disappointed” kind of hell. Think more of the “excommunicated” and “publicly ostracized” kind of hell. Family and those closest to you suddenly dropping you, stigmatizing you as if you had just destroyed their country or something. I think what touched me so deeply was that this band’s story was such a strong metaphor for life to me. Like, I didn’t even have to do anything to get into character. It was, in a way, my story, just in a different expression. A story of daring. Of struggling. Of experiencing people turning away or not supporting, and the pain that comes with that. Of overcoming. Of not letting yourself be talked out of it. And I believe it’s not only my story. It’s a very universal story for anyone who chooses to live in a certain way. Not the easy way. But a very worthwhile way. I mean, I could feel it, on a smaller scale, just before going into the shoot! I could hear all the voices that did not approve of giving ballet so much priority in my life. I was anxious about whether I would be able to perform at my best. Whether it would show that I started ballet as an adult. Whether I would conduct myself professionally enough. Whether we would all vibe, without the potential tensions and undertones. And then the tutus! Oh the biggest of all: I got my period, just on the night before the shoot. Two days early. Amazing. Here is to wearing a white leotard, a white tutu, pale-pink dance tights, and having to get out of all of them for the slightly more frequent bathroom breaks, just in case. Here is to rather curl up on the sofa and watch Netflix all day. Yes, all this is pain on a much smaller (and maybe pity) scale, but it’s often an accumulation of these kind of seemingly small fears and anxieties that can prevent us from living the everyday life that we truly desire. I think in the end there is ONE THING that gets you over all the opposition, the fears, whether big or small: The realization that NOT doing it is NOT an option. At some point that voice deep inside of you, even if it’s a very quiet one, becomes too persistent to be overheard. Doing ballet, doing this video shoot was what I clearly longed for. And there was such an incredible beauty in knowing that I was about to meet people that shared this sentiment and who were clearly striving to create, too, despite the fierce resistance they encountered. And, hey, getting my period simply meant that everything was working, and that I was in the deepest feminine power of the month! THE DAY OF THE SHOOT. I wish I could say that there were challenges, and struggles, and how a few things went wrong, everything that would make a good story. But actually, it was simply an amazing and easy day. It was actually ridiculous how much fun it was and how smooth it went. I dropped of my son at one of his school friend’s - the mom had super kindly agreed to have him over for half of the day. Instead of an hour, it took me only half an hour to get to the location. It was a real studio. With a real professional crew. And a top-notch professional make-up artist. The tutus fit (although we hadn’t tried them on before). When it became clear that the shoot would go for the whole day, my son’s friend’s mom had absolutely no issue at all to have him over for the whole day (I mean, hello? What an amazing woman?). Meeting the band founders and their adorable kids was super fun. A metal-worthy selfie with Ashleigh. The crew was clear in what they wanted, and also very appreciative. Like, everyone was super appreciative and supportive. Kate did such a great job coaching is through the repetitions. I enjoyed so many meaningful conversations. There were just good vibes. Working with dancers Lindsay and Cathy was the most easy and fun thing of all. This first look was supposed to be “doll-like”, or “Marie-Antoinette-ish”. Nailed it! There was an excitement in the air, of creating and working together. And everything that might have been a challenge, just got smoothed out. Like: The make-up took longer than the crew had expected, but in the end we caught up and finished on schedule. Dancing on pointe on concrete for that many hours and repetitions was quite the deal, but it worked! 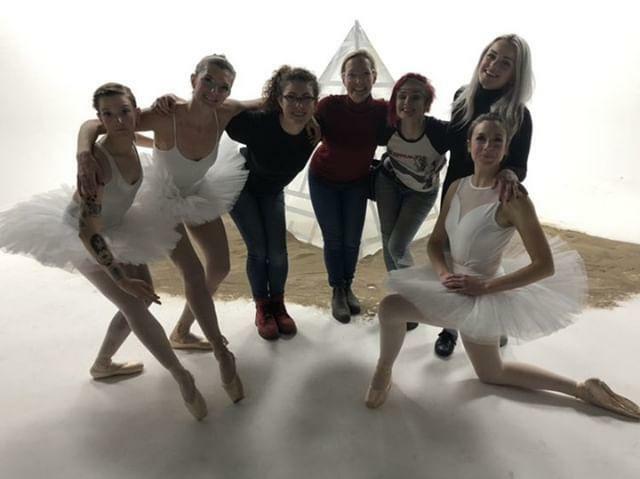 I found it very challenging to dance with so little space - with a layer of sand behind me, all of us dancers very close to each other, and the camera angle limiting us further to the front and to the sides. I honestly think that I didn’t handle it too well - but I will not hold that against me. It was the first time in such a situation, and considering that, I think the crew ended up with enough really good footage. At least that’s what they said. There is no cookie cutter approach to being a dancer. I think that from being heavily influenced by the professional ballet world, we think that “you have to get a professional training and then a company contract”. Well, that’s one way of going about it. On the other hand, you could build your “career” differently. You could come up with your own training, for example by finding a mentor and then working with him/her for a few years, and slowly build freelance opportunities that are sort of outside the box. I think that we are seeing a huge rise in ballet’s popularity right now, and I think that this will only increase new performance opportunities and paid gigs! And some of these could be filled by professional or semi-professional adult dancers. Follow your urges and build your strengths. I started to put myself more in front of the camera NOT because I was hoping to get something out of it. It was simply an urge, I felt like it could be fun, and I wanted to get more comfortable with it. 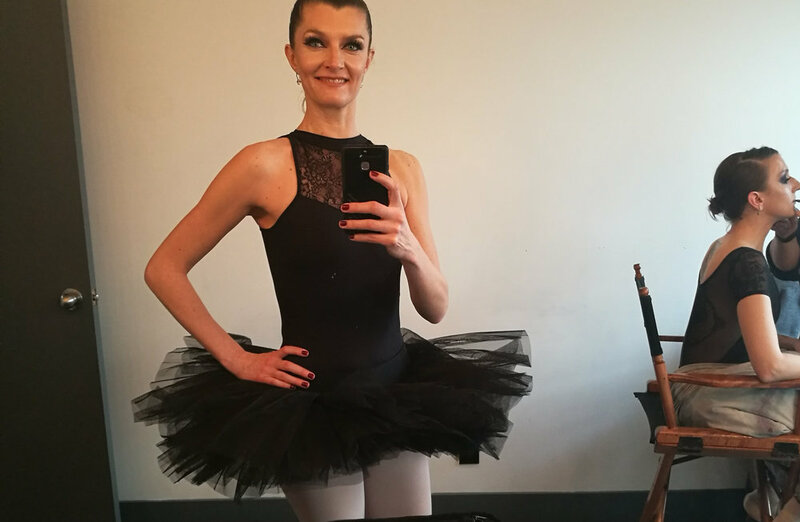 And while I know that there are more technically skilled (adult) ballerinas out there - I have my height, my lines that are just part of my appearance. For the video shoot, the lines are probably more important than the overall skill level, simply because of how music videos work! So for me that means that part of my focus is to work on making my height and lines look good, by really understanding how to create specific poses and by stretching and strengthening for a long look. And this will be very different for everyone - but it’s helpful to realize what creative urges tug on you, and what advantages you bring to the dance table! Stick to your story, share who you are. I believe that people come together for a reason, and that interesting projects have a deeper origin. Like this video gig looked like it came out of the blue, and it did, but there was a common denominator of “overcoming” and “breaking with how you ‘should’ live your life”. So many conversations I had that day were somehow deeper than your usual small talk. Maybe that was what brought us together, and that’s why we all vibed. It was not just a gig - it was a day full of inspiration and time truly well spent. Have the courage to commit to your desires and trust, unapologetically. Like, I might sometimes come across as a bit unusual with my ballet endeavors, and I know that there are probably a lot of people around me who think it’s all a bit over the top and delusional. I have experienced lack of support, or simply being not acknowledged or ignored, and more or less openly criticized. That can make it hard to push forward. But my experience has always been that good things happen when you don’t hold back. When you don’t apologize for or play down your ambitions. Like, I totally admire what Ashleigh and Colin are doing with Tulip, and how Ashleigh is bringing her opera training into a new context. I think we will hear from these guys. And as hard as it is, and as unlikely, I will keep looking for new adult ballet opportunities. And like this video gig shows, like-minded people will find each other and things will happen. Know your top lever for making things happen. You have to be in a state of readiness for things to appear. So you need to be aware of what keeps you in that state. This is something I totally by chance learned from a Misty Copeland interview. I don’t even remember which one - but she was talking about all the million things that she was doing - her UA deal, photo shoots, interviews, TV appearances, the book deals, movie etc etc - but how she didn’t let ANY of this interfere with taking class every day. Because class is the reason why all these opportunities come up for her. That hit home for me. I mean, yes, on a different level obviously, but I instantly knew that this is what would keep me healthy and ready, too. So that’s what I do. I take class every day during the week, plus some complementary strength work at home, and I don’t let anything interfere with that. From that level, I can more easily ramp up for anything that comes my way (like the Residency Programme last year, rehearsals, this video gig, street performances). And this might well be very different for everyone, depending on what your schedule and needs are like. But I believe that there is always that one thing that must become non-negotiable in order to keep you sharp. Over the next days, my “high”, that level of excitement from this unique experience, slowly went back to normal levels. After all, it was “just” a day, a singular performance experience. A hint of an idea, or a quiet confirmation maybe. That I can do this. And you can, too. There is no cookie cutter. Stay open. Keep working on technique and strength, and build an amazing and cared-for body. Think of alternatives to the usual deals. Welcome new potential ballet performance opportunities. Follow those weird ideas that keep going through your head. Connect with like-minded people. Do it all like you mean it. And then something will come. And maybe something completely different. Big gratitude to band founders Ashleigh and Colin (@wearetulip), choreographer and coach Kate (@kate_kernaghan), dancers Cathy (@dirtbagindanceclass) and Lindsay (@lindsayhaeber), art department Hayley (@haelaaaaa) and her team, director Alex and his crew (@thetrenches) and make-up artist Arabella (@arabellatrasca) for this very special day! Older PostHave You Given up on Your Adult Ballet Body Yet? Four Bodyweight Myths, Examined.